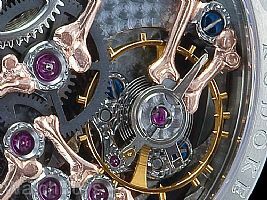 Master watchmaker Stefan Kudoke shared with us a prototype several years ago for a very special watch. 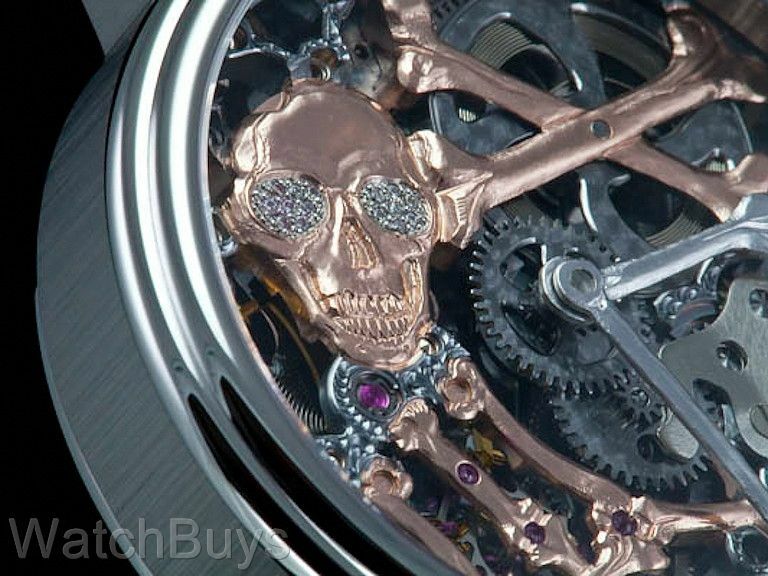 He knew that many watch collectors love skeleton watches (the ability to see "through" the movement), but his idea would stretch the concept of a skeleton watch to the literal. 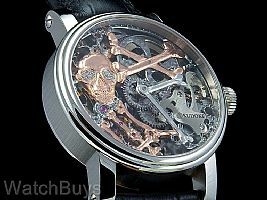 We welcome the arrival of one of the most interesting watches we have every carried - the Stefan Kudoke Real Skeleton. This watch is both a true skeleton watch in terms of movement design, and a true skeleton in presentation. This watch takes months to complete in Stefan Kudoke's atelier in Dresden, Germany. 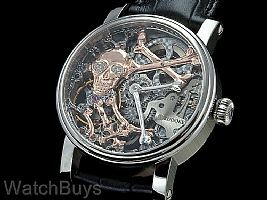 If you are fortunate you visit his workshops one day, you will find no CNC machines (computer controlled machines that are responsible for the production of most watch components). Instead you will see an assortment of hand tools. The movement plate and bridges have been coated in rose gold and skillfully formed into the shape of a skull and crossbones. The hour and minute hands are coated in black gold (rhodium) and likewise are shaped into bones – the shape and curve of these hand engraved parts results in a three-dimensional dial unlike any you've seen. 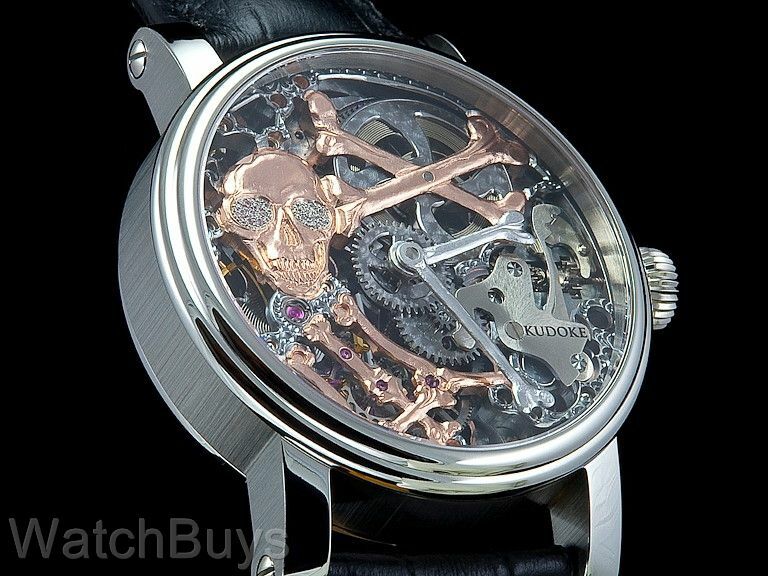 The Kudoke Real Skeleton features a 42 mm case with a two level finish consisting of polished lugs and bezel and a satinized case. It is finished with an onion crown, screwed lugs and black calf leather strap with alligator grain and engraved Stefan Kudoke tang buckle. 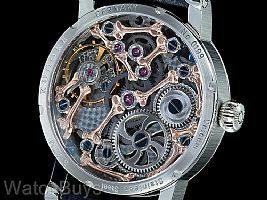 WatchBuys is proud to have been selected by Stefan Kudoke as his official and authorized representative in North America. We think you'll be both impressed by his watches, and pleased to own a creation from one of Germany's newest talents.